The Infinix HOT 4 X557 is one of the latest Android smartphones manufactured by Infinix shortly after the release of the Infinix HOT S that comes with a finger print sensor. The Infinix HOT 4 is a quick successor of the Infinix HOT 3 that was also released sometime this year. Apart from the phone possessing a dual high stereo quality speakers, the HOT 4 also boasts of a fingerprint scanner like you will find in the HOT S models. In addition to that, you can be assured of working for longer hours with its 4000mAh battery. Camera - 8MP, 5MP rear and front camera respectively. 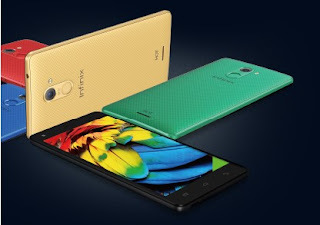 The Infinix HOT 4 is expected to sell between 36,900 to 40,000 NGN.